The Immaculate Madonna was already venerated for her help during the 1656 plague and 1693 earthquake when Capuchin monk Antonio Collice carved her wooden statue in 1718. 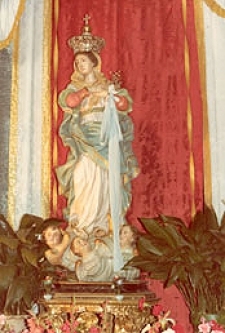 After the earthquake of February 12, 1854, she received the title Protector and Patron of Luzzi. During the centennial, the statue was crowned canonically November 17, 1954. The Immaculata's celebration there this day begins with mass and a street procession; then, after reading a decree verifying her miraculous assistance, the mayor hands candles to the parish priest.